This piece, originally written for Punch in 1985, sees Burgess responding to the announcement that he was to be the subject of a biography. 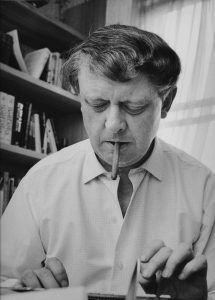 The biography in question, Anthony Burgess by Roger Lewis, was eventually published in 2002, but it was not the first book to be written about Burgess and his work. The first book about Burgess appeared in 1971. Anthony Burgess by Carol Dix is a short critical book, originally written in association with the British Council. The following year AA DeVitis published a slightly more in depth study of Burgess’s work. In 1979, Geoffrey Aggeler published Anthony Burgess: The Artist as Novelist, a monograph that highlights the importance of Burgess’s fiction. Burgess corresponded with Aggeler over a number of years, eventually becoming friends with him. Aggeler later edited a collection of critical essays about Burgess in 1986. Another biography of Burgess appeared in 2005: The Real Life of Anthony Burgess by Andrew Biswell. Writing about Burgess has never been an easy task, the truth of his life buried under tall tales and fictionalised biographies. His own autobiographies, Little Wilson and Big God (1987) and You’ve Had Your Time (1990), are vibrant and funny, though the truth of Burgess’s life remains contested.